Prior to the 1950s, many rural areas in the US had no electricity. Many companies sold battery operated vacuum tube radios for use in these areas, the radios are commonly called Farm Radios. Farm radios are often available at very reasonable prices and can make a good restoration project. 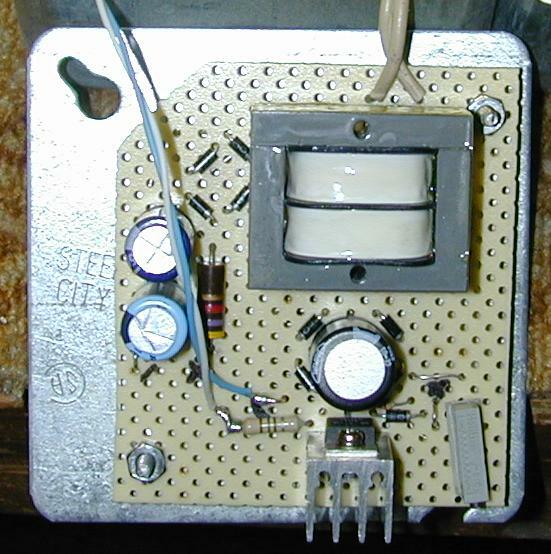 Farm radios typically used a large 1.5V battery for the tube filaments and a 90V battery for the plate (B+) supply. These batteries are hard to find, expensive and have a limited life. This project involves constructing a power supply that allows this type of radio to be operated from a modern 120VAC power line. The radio used for this project was made under the brand name Western Air Patrol by RCA/Hazeltine, it uses four 1.5V tubes. This project should be adaptable to other farm radio models by changing one resistor in the B+ circuit. 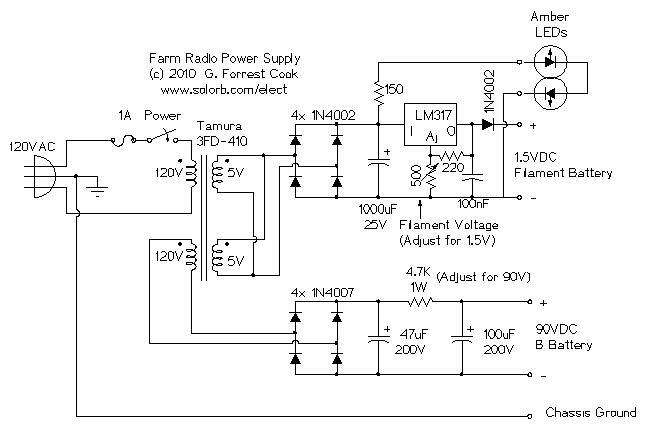 The heart of the power supply is a Tamura 3FD-410 5V dual primary/dual secondary transformer. These are available from DigiKey.com for reasonable prices. Normally, the transformer's primary windings would be connected in series for 240VAC operation or in parallel for 120VAC operation. This circuit takes one of the primaries and repurposes it as a 120VAC secondary. For this to work, the transformer should be somewhat over-rated, which it is in this case. The two 5V secondary windings are combined in parallel and sent to a bridge rectifier and filter capacitor to produce around 7VDC. This DC voltage is current-limited by a 150 ohm resistor and used to drive two amber LEDs. The LEDs can be hot-glued to the inside of the radio above the dial to provide dial lighting and power-on indication. The 7VDC is also sent to an LM317 adjustable voltage regulator IC. The LM317 normally produces a minimum voltage of 1.7V, which is too high for this application. A series 1N4002 diode is used to drop about .5V to produce a minimum voltage of 1.2V. The regulator is adjusted so that the filaments operate at 1.5VDC. The 90VDC B+ supply uses a bridge rectifier across the transformer's second primary winding to produce around 160VDC. The rectified DC is filtered through a pair of electrolytic capacitors and a series resistor. The resistor drops the B+ voltage to the required 90V. The power transformer and associated parts were mounted on a piece of perforated breadboard material, connections were soldered on the bottom of the board using point-to-point wiring. The LM317 regulator should be mounted on a small heat sink using heat sink grease. All external connections were brought out to small wire loops on top of the breadboard, the radio wiring can be soldered to these loops. The power supply board was mounted to a standard 4"x4" electrical utility box cover using two 6-32 screws and 1/4" spacers. The switch and fuse were mounted in a separate 2"x4" electrical utility box, a standard light switch was used. The two boxes were joined together by knocking out two adjacent knockouts on each box and connected with standard electrical box connectors. 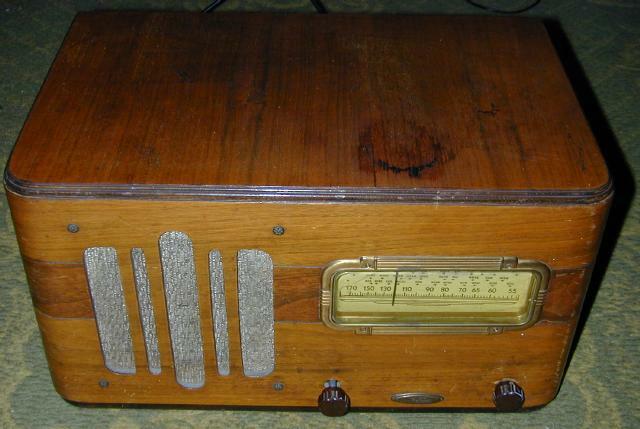 The power supply and switch assemblies were connected to the inside of the radio using a pair of wood screws. It may be possible to repurpose the radio's power switch for controlling the AC supply. In this radio, the switch on the volume control had two circuits, one for the 1.5V battery and one for the 90V battery. The two DC circuits should be unsoldered from the switch, connected on as the switch would, and insulated to prevent shorts. The two switches can then be paralleled and brought out with two wires to the power supply box. Unfortunately, the original volume control pot in this radio was bad, so I used a substitute pot that had no switch and built the power switch as shown in the photos. The filament voltage regulator should be set to the minimum value and then connected to the radio's filament circuit. The regulator should be adjusted up until the filament voltage reads 1.5VDC. The filaments in this radio's tubes produce a very faint glow compared to most tubes, you may only be able to see them in the dark. The B+ supply voltage is adjustable by changing the value of the 4.7K 1W resistor. If the B+ is too high, use a resistor with a higher value, if it is too low, use a resistor with a smaller value. Now is a good time to align the radio. The trimmers on the variable capacitor should be adjusted to set the dial frequency and antenna resonance, then the IF transormer adjustments should be tweaked for the loudest signal. For the best IF adjustment, move one adjustment clockwise a tiny amount and the other counter-clockwise a tiny amount. This produces a wider IF bandwidth. Turn on the power, tune in a station and enjoy. The radio shown uses a mere 2W of AC power to operate and it produces plenty of volume. An interesting feature of radios that use these low voltage tubes is that, unlike most tube devices, they turn on almost immediately. This is because the tubes use their filaments as direct cathodes, producing a very fast cathode warm-up time.